The world will have to live with surprise asteroid attacks on the scale of Friday's Russian fireball, at least for a while. 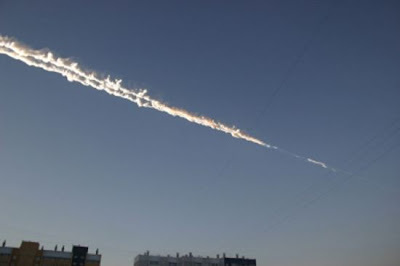 The meteor that exploded over the Russian city of Chelyabinsk without warning Friday (Feb. 15), damaging hundreds of buildings and wounding more than 1,000 people, was caused by a space rock about 50 feet (15 meters) wide, researchers said. Asteroids of this size are both difficult to detect and incredibly numerous, so it will take a long time for astronomers to find and map out the orbits of all the potentially dangerous ones. Besides, researchers have bigger fish to fry. 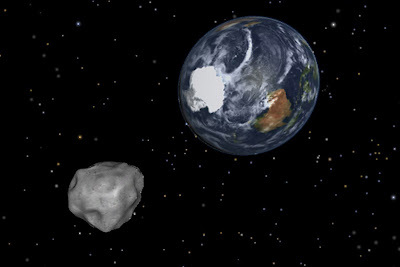 Asteroid 2012 DA14, a large space rock, will come close -- but not too close -- to earth on Friday. "We are focusing on the larger asteroids first," Chodas added. "They are the ones that are the most hazardous." In 1998, Congress directed NASA to find all of the near-Earth asteroids at least 0.6 miles (1 kilometer) wide that could pose an impact risk to Earth. Such large space rocks have the potential to end human civilization if they hit us. NASA met that challenge several years ago, and its scientists have now identified 95 percent of the 980 such mountain-size asteroids thought to be cruising through Earth's neighborhood. Happily, none of the known behemoths pose any threat to our planet for the foreseeable future. But the outlook isn't so rosy for smaller asteroids. Observations by NASA's WISE space telescope, for example, suggest that about 4,700 asteroids at least 330 feet (100 m) wide come uncomfortably close to our planet at some point in their orbits. To date, astronomers have detected less than 30 percent of these objects, which could destroy an area the size of a state if they slammed into Earth. And researchers have spotted less than 1 percent of asteroids at least 130 feet (40 m) wide, according to officials with the B612 Foundation, a nonprofit organization dedicated to predicting and preventing catastrophic asteroid strikes. Space rocks of this size can cause severe damage on a local scale, as the 1908 "Tunguska Event" shows. That year, a 130-foot-wide object exploded over Siberia's Podkamennaya Tunguska River, flattening roughly 825 square miles (2,137 square km) of forest. 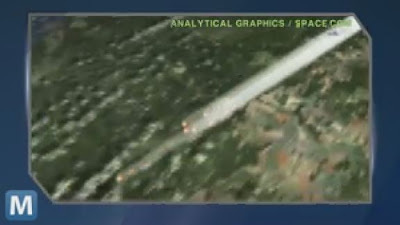 A space rock in this size class gave Earth a close shave Friday. 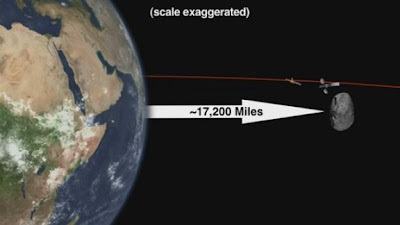 The 150-foot-wide (45 m) asteroid 2012 DA14 — which was just discovered in February 2012 — cruised within 17,200 miles (27,000 km) of our planet, marking the closest approach of such a big space rock that was ever predicted in advance. Overall, scientists think 1 million or more near-Earth asteroids are lurking out there, and just 9,600 have been identified to date. Searching near-Earth space in infrared wavelengths is a good way to find potentially hazardous asteroids, Chodas said, and many other scientists agree. The B612 Foundation, in fact, plans to launch an infrared space telescope called Sentinel to a Venus-like orbit in 2018. From there, the instrument would peer out toward Earth's neighborhood without having to contend with the sun's overwhelming glare. In less than six years of operation, Sentinel should spot 500,000 near-Earth asteroids, including the few remaining undetected mountain-size space rocks and more than 50 percent of the 130-footers, B612 officials have said. The goal is to find big, dangerous objects several decades before they may hit us, giving humanity enough lead time to mount a deflection mission. But even if Sentinel lives up to its billing, many thousands of 130-foot asteroids would remain undetected, as would even more objects the size of the Russian fireball's parent body. So we're likely to be caught off guard again, as the people of Chelyabinsk were Friday. "NASA has recognized that asteroids and meteoroids and orbital debris pose a bigger problem than anybody anticipated decades ago," said Bill Cooke, head of NASA's Meteoroid Environment Office at Marshall Space Flight Center in Huntsville, Ala.